A Grand Tour of the Lake District, visiting the favourite valleys and mountains of Alfred Wainwright, Britain’s best known ‘fellwalker’ and guidebook writer. For each day’s walk there are at least two route choices including a moderate option and a more challenging alternative, which will take in one or more ‘Wainwights’ (summits described in his 7 volume ‘Pictorial Guide’). The options always start and finish in the same place so you can mix and match as you go along. On this tour we guarantee: 7 lakes including the ‘King’ and ‘Queen’ of lakes, and numerous mountain tarns; England’s highest peak; traditional Lakeland villages; Herdwick sheep; the stomping ground of the Romantic Poets; and above all, spectacular scenery unlike anywhere else in the world!. Todays walk starts with a gentle climb out of Ambleside to the shoulder of Loughrigg Fell offering extensive views over Windermere’s sparkling waters and of the Central Fells. Depending on your choice of options you can visit Elterwater and follow the Cumbria Way along the meandering Great Langdale Beck, or climb to Loughrigg’s summit and stride out over the ridge forming the watershed between Grasmere and Langdale, ticking off the Wainright summits of Silver How and Blea Rigg, before descending into Langdale past the sensational Stickle Tarn. Options: (A) Moderate. 7½ miles. 1200ft. 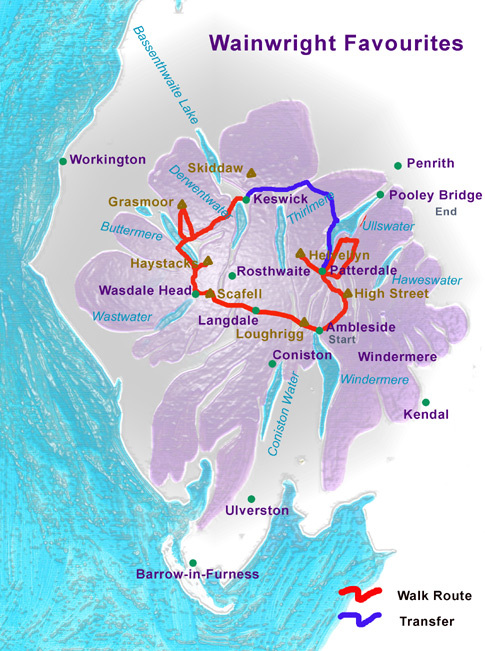 ; (B) Challenging (includes 3 Wainwright summits). 8½ miles. 2800ft. Lake District fell walking doesn’t come much better than today’s offerings. One of your options follows an ancient trading route over Esk Hause to reach Wasdale, Cumbria’s most remote valley containing England’s deepest lake and, it is said, it’s smallest church. Other options allow you to ‘bag’ Wainwright summits along the way, including Bowfell, Esk Pike, Broad Crag and the highest point in England, Scafell Pike. Three options today of varying degrees of difficulty. Choose the route that’s best for you. Leaving Wasdale your route options today include following in the footsteps of ‘Old Moses’ who reputedly distributed moonshine wandering from one valley to the next across the passes through the mountains. Alternatively, you can tick off a couple more wainwrights in the form of Great Gable and Green Gable on your way to Borrowdale. Wainwright was very fond of Borrowdale, saying it contained “the loveliest square” mile in Lakeland. Options: (A) Moderate. 7 miles. 1650ft. ; (B) Challenging (incudes 2 Wainwright summits). 7 miles. 3050ft. Borrowdale is steep on all sides but there are hidden weaknesses which can be exploited to provide a well graded ascent out of the valley. Tremendous views taking in all the major fell groups of the Lake District await. Choose between a moderate hike descending the valley of Far Easedale or collect more Wainrights in a spectacular ridge walk to Helm Crag (a.k.a. “The Lion and the Lamb”). Both options end at the lovely Grasmere, former home and resting place of William Wordsworth. You can visit the house where he and his sister, Dorothy lived and where he wrote many of his famous poems. Options: (A) Moderate. 7 miles. 2000ft. ; (B) Challenging (incudes 4 Wainwright summits). 9½ miles. 3100ft. Crossing the range to Patterdale, today’s options include following the Coast-to-Coast path through the lovely Grisedale Valley, or a more challenging route over Helvellyn with the option to bag 3 more Wainwright summits and cross ‘Striding Edge’. Whichever route is chosen, you are guaranteed a day of excellent walking as you cross from the Central to the Eastern fells. Options: (A) Moderate. 7½ miles. 2000ft. ; (B) Challenging (incudes 3 Wainwright summits). 9½ miles. 3500ft. The final day of this Grand Tour of the Lake District travels the length of Ullswater, ‘Queen of Lakes’. As always, we provide different options to suit your inclination and today you can choose between a walk along the quiet Eastern shore path via Howtown, or a stride out on the high ridges of the nFar Eastern Fells where Roman Armies once marched. The more challenging option today includes at least 4 Wainwrights with the opportunity to extend the walk to collect 3 more. Both routes come together at the bronze-age stone circle known as ‘The Cockpit’ before an easy walk down into the village of Pooley Bridge, situated on the northern tip of Ullswater. Options: (A) Moderate. 9 miles. 1120ft (option to reduce to 5 miles + 750ft. by taking a ferry for 35 minutes at start of day (fare approx. £7). ; (B) Challenging (incudes 4 Wainwright summits). 12 miles. 3000ft. Let us know if you would like us to arrange a transfer to Penrith station. A Wandering Aengus information pack containing: all necessary maps and our own weather-proof 'route cards', laminated locator maps for each night's accommodation and details of local facilities - including locations and opening times of restaurants, cafes, ATMs, supermarkets etc. Windermere station is the terminus of a branch line from the main North-West London to Glasgow rail link (change at Oxenholme). 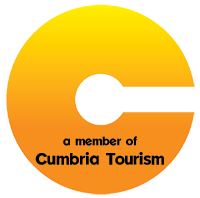 Ambleside is a short (5 minute) taxi or bus journey from the station. The holiday ends at Pooley Bridge which is approximately 5 miles from Penrith rail station on the main North-West London to Glasgow rail link. Alternatively, if you are arriving by car it is usually possible to arrange parking for the duration of the walk (possible extra charge). This collection of excellent point-to-point walks will give you the option of being among the fells on a journey from one valley to the next, using the passes used for centuries as a means of communication and trade before the development of roads going around the mountains. Alternatively, it is possible to challenge yourself with one or two harder options provided on each day which tackle the summits beloved of Wainwright.